Google is updating the way they do certifications. Google is providing these certifications as a concrete and tangible way to measure skills and knowledge. 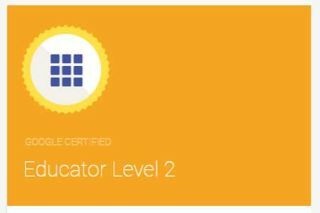 Level 1 is for educators and 2 for trainers and innovators. Below is a brief description with a link to more information. This post from Shake Up Learning provides additional insight and you can read below from Google's newsletter. If you don't get the newsletter you can click here. The monthly newsletter showcases relevant tools and programs from across many Google teams and partners. Why did Google choose to update the existing certifications? The original Google Certified Teacher program was created in 2006, and the original Apps Certified Trainer program was introduced in 2010. Despite the fact that Google for Education’s mission, scope and products had changed over the years, not much had changed with the certifications other than the branding of the trainer program and exams. We want our certifications to reflect the various levels of expertise we saw in our community and to assess the different skills that each audience would actually need to implement the tools. So this year, we came out with three distinct Google for Education certifications - for innovators, for trainers and for educators. Although there is still some overlap, we think that these three programs now recognize the distinct knowledge, skills and expertise exhibited by the people they’re intended to certify. What are the new features of the new Educator certifications? We’re very excited about the new certification exams for educators because they actually assess how well someone can use Google tools in a classroom setting. Our team collaborated with a group of global educators to determine and prioritize the top classroom use cases. We built the scenarios in the exams to reflect those, and educators are asked to complete a series of real-world tasks. Using multiple Google APIs, the system is able to check whether a given task was completed correctly. We intentionally kept some of the knowledge-based question types in Part I to make sure that we were not only testing skills and performance, but also mindsets and best practices. We hope to move the trainer exams in this direction as well. How does Level 1 differ from Level 2? We designed the content in the training center and the certification exams around the SAMR model. It isn’t a perfect science, but the Level 1 exam assesses skills at the Fundamentals level. In SAMR terms, this would be substitution and augmentation. We assess the basic skills a teacher would need in order to use certain Google tools in the classroom - for example, creating a Doc and adding it to a folder in Drive. I think the biggest misconception is that the Level 1 exam is for beginners - it’s not! The goal of the training programs is to get as many educators using our tools regularly (and proficiently) in the classroom, so the Level 1 is exam is designed for someone who is familiar with our tools, but at a fundamental level. On the other hand, the Level 2 exam mirrors the advanced content in the training center, which, in SAMR terms, is more about redefinition and modification. Questions in Level 2 might ask about personalized learning models or more advanced features of our tools. An educator with this certification will have a deep understanding of how Google tools can enhance their students’ learning. How can educators use these new certifications? I always like to say that a certification is for the user. After investing time in your own training and professional development, online certifications are an easy way to prove your mastery to yourself and to others. We’ve seen a variety of intrinsic and extrinsic motivations for becoming certified. Engaging in professional growth by building new skills is probably the top motivation. In addition, the badge is a great way for educators to distinguish themselves amongst their peers. We’ve heard that some schools are giving professional development credit for achieving a certain level of certification and we hope to encourage more schools to recognize this as well. For trainers like you, these exams are the best way to assess how well the educators you’re training understand your content and how prepared they are to actually use these tools once the training is done. We really hope you’ll start using these exams in your trainings and encouraging the educators and districts you work with to incorporate them as well. Who can take the certification exams? Anybody can take the certification exams; however, our target audience for the Level 1 and 2 exams is educators. The training content is based around classroom pedagogy from an educator’s perspective. The Level 1 exam costs $10 and the Level 2 exam costs $25. We’ve offered them at an extremely low cost to ensure that anyone who wants to get certified can do so without financial burden - we are definitely not in the certification business to make money! Our goal is to see as many educators get recognition for the effort they put into their professional development. What’s your favorite thing about these new certification exams? The new exams give us a lot of insight into how engaged and savvy people are in using our tools, which helps us better serve the needs of our users everywhere. For example, we’re able to see that the scenario-based questions around creating and editing a Google Site have the highest fail rate. This type of information helps us make decisions on where to focus our training efforts moving forward and gives us better data to give to our product teams to help them improve the products. This really excites me! As a former educator, I know how little time one generally has in a given school day. I feel a great sense of joy and accomplishment anytime I can make things a bit easier, simpler, and faster for the classroom.